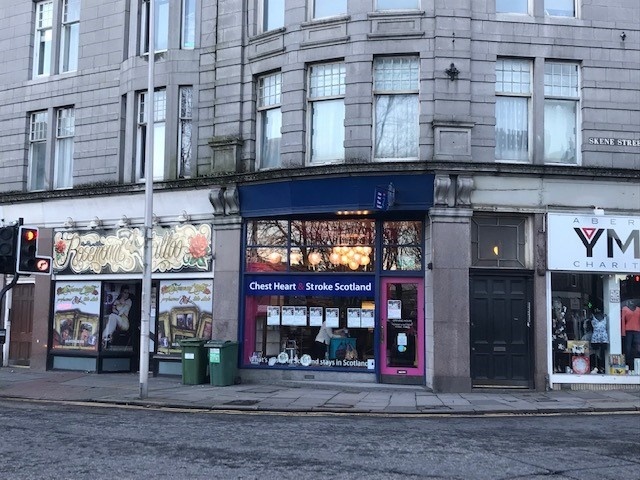 Shepherd Chartered Surveyors is offering premises within a popular retailing thoroughfare in Aberdeen to let. The premises are located on a prominent corner location of Rosemount Viaduct at its junction with Skene Street just a short distance from Union Street, Aberdeen's main commercial thoroughfare. Metered on-street parking is available within the area while Denburn car park is also nearby. The 823 sq ft premises comprise of the ground floor and basement of a four storey, traditional tenement building and feature a large display window fronting onto Rosemount Viaduct, thereby benefitting from high levels of vehicular and pedestrian passing traffic. The accommodation has been split to provide sales area, changing rooms, staff room, WC facilities with additional storage areas located at basement level. A rental of £8,500 pa is sought. Interested parties should contact the sole letting agent on 01224 202800 for lease terms.